Ingrid and Michael Ceribelli, founders of Frankie Alice's Beachside Boutique, have extended their partnership from marriage into the business realm to launch a retail clothing and accessory business named after Michael’s grandmother, Frankie Alice. Ingrid is an experienced retailer who recognized a market opportunity after struggling to find an appropriate blend of quality, comfort, style and price point she wanted. "I've been in retail for over 20 years and have run everything from small gift stores to large department stores," Ingrid said. "It was time for me to have something that was my own that I could stand for and enjoy selling. It's been my dream to open my own store since I started in retail." Frankie Alice's offers everyday, authentic clothing and accessory items that are handmade from both leather and cork. "Our items are not fast fashion and will last you a long time," Ceribelli explained. "They have classic lines with a little twist of personality. We sell high quality at an honest price point. Our prices aren't as high because we don't use artificial sales and we keep our margins low because we want customers to be able to get the good clothing they desire." Co-founder Michael Ceribelli is a Navy veteran who is quick to credit his wife Ingrid for much of the store's success. 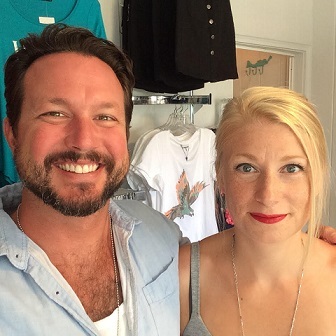 "If not for Ingrid’s expertise in the industry along with her impeccable taste in fabrics and fashion, this venture might not have become such an extraordinary shopping phenomenon in Flagler Beach as quickly as it did," he said. "I’ve always broken away from the mainstream so when it was time for my wife and I to put our energy and knowledge towards our own business, I jumped in head first. Of all the things I’ve learned in life as well as the military, hard work and commitment are quite possibly the two most valuable assets we possess as entrepreneurs and business owners." Ingrid Ceribelli's advice for aspiring entrepreneurs is to be both prepared and patient. "Do your research as much as you can," she said. "Start out small. Even when we moved into our store it was with a minimum amount of inventory and we put everything back into the business to increase inventory."